Following the 2011 popular uprising which led to the ouster of President Mubarak, the Muslim Brotherhood emerged as a dominant force in Egypt’s political scene. Thanks to a near majority of votes in parliament, the brotherhood’s candidate Mohamed Morsi became the first democratically elected Egyptian president. Morsi’s first and only year in power was very controversial. His unpopularity reached new heights at the end of 2012 over the draft of the new constitution and his attempt to make his decisions exempt from judicial reviews. On June 30, 2013, millions of protesters took to the streets, requesting his resignation. The military quickly intervened and gave Morsi and his government 48 hours to respond to popular demands – after which they announced the end of his presidency. Founded in 1928 by Hassan Al Bana, Egypt’s Muslim Brotherhood is one of the oldest and most influential Islamist organisations in the Middle East and North Africa. The brotherhood’s original and current mission revolves around religion, political islam and social justice. From reformist groups to radical terrorists, its ideology appealed to broad audiences in Egypt and beyond. The group’s paramilitary became particularly notorious for its role in ending the British colonial rule in the early 1950s alongside General Nasser and the Free Officers. However, the movement’s public calls to instate sharia (Islamic laws) led to a clear ideological division. Indeed, the radicalization and embrace of violence by some of its strands led to an assassination attempt on then President Nasser. As a result, the Brotherhood was banned and its members persecuted, imprisoned and tortured. Despite the official crackdown from the 1950s onwards, the group continued to grow clandestinely while performing a number of social functions such as running hospitals, schools, youth clubs, charities, day care centres, etc. After President Hosni Mubarak came into power in 1981, the Muslim Brotherhood made visible attempts to participate in Egypt’s politics. The party’s consistent electoral successes and clear appeal to the public led to yet another wave of repression that lasted until 2011, the year of Arab revolutions. The Muslim Brotherhood made substantial political advances after the 2011 revolution. Its Freedom and Justice Party won the parliamentary elections of January 2012 and so did its presidential candidate, Morsi, in June 2012. From the very beginning, Morsi faced significant resistance from the judiciary and military. On two occasions, Egypt’s Supreme Court announced the dissolution of parliament (where the Brotherhood had won a majority of legislative seats). Furthermore, Morsi’s draft constitution, written by an Islamic-led assembly and modified by consecutive executive decisions, plunged the country into a sustained period of social unrest. For instance, article 2 states that sharia (Islamic law) would be the main source of legislation, a major setback for human rights and democratic advancements. The presidential decree sparing his decisions from judicial review only exacerbated an already furious opposition representing roughly half of the country. On June 30, 2013, against the backdrop of an economic crisis, mass protests flooded the streets of Egypt asking for Morsi to step down. After a 48 hour ultimatum to announce reforms, the military deposed Morsi and placed him under house arrest. His removal spurred violent clashes between pro and anti Morsi supporters, as the Brotherhood called for an uprising. Since then, members of the Morsi government as well as Muslim Brotherhood affiliates have been arrested. 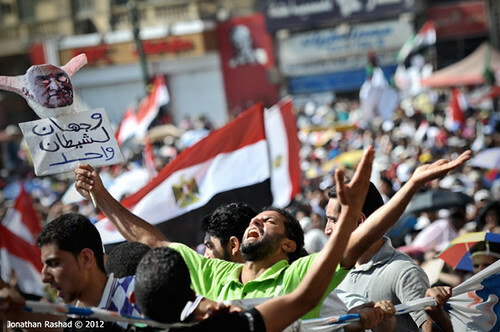 The political future of the Muslim Brotherhood is uncertain. The party may decide to participate in the next elections, or decide to boycott them. The transitional government might also ban them from participation which would in turn considerably hamper any national dialogue efforts. While the Brotherhood hasn’t resorted to violence in decades, its leaders may well decide that only violence can restore “justice”. Fadela currently lives in London where she works for a children's charity. She has a Bachelor in Economics, a Master in International Relations (Institut Barcelona d'Estudis Internacionals), and a Master in Conflict, Security and Development (King's College London). Fadela is passionate about international development with a particular interest in the Middle East and North Africa region.